Weather has been extremely hot at Malaysia these days that I feel thirsty for most of time throughout the day. I cannot imagine how my skin take it when I head out for lunch in these hot afternoon, and I would really, really like to reward my skin for all the battle it's doing to combat with these vicious heat hence I chose Hadabisei Super Moist Facial Mask to moisturized my skin at night. I've heard many compliments of this facial mask and finally get to witnessed it myself. If you're still asking should you put on a facial mask? The answer is always yes, as a good facial mask will hydrates skin, remove excess oil, improve appearance of pores and brighten skin complexion. 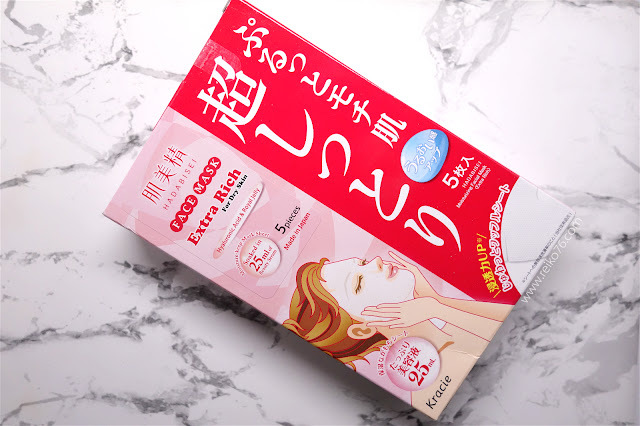 Hadabisei Super Moist Face Mask is rich in serum that are formulated with Hyaluronic Acid and Royal Jelly, it gives skin an instant boost of moisture and hydration that makes my skin happy! Set aside a bit of "me" time as applying facial mask can be quite therapeutic. Cleanse and tone skin as prep for facial mask application as it will let the goodness of facial mask penetrate thru skin. While waiting for facial mask does it work, listen to relaxing music, some light reading, or even meditate are some quality time for one. Even though I clean my face through proper face washing routine yet I still it isn't "clean" enough. Good facial mask does provide "detoxing" process where dirts and impurities can be dissolve and draw out through a face mask which leads to improvement on appearance of pores. Aside from deep cleansing, facial mask does help lift dead skin cells that are accumulate on our skin, which believe to unclog pores too. Clogged pores are often troubles to skin, hence if dirts and impurities were trapped inside pores and pushed further down into pores, bacteria can be develop and prone to break outs and inflammation. Regular facial mask does keep skin surface clean and pores unclogges. Mask with rich serum like Hadabisei's which are infused with Hyaluronic acid, Royal Jelly and Lemon Extract, these ingredients can soften skin's hardened keratin and let the rich moisturizing serums penetrates into skin's deeper layer which ensures an overall improvement of skin tone. Skin will become smooth and supple, with radiant and even complexion. To make sure I don't waste all the skincare products I've applied on my skin, I always make sure I apply facial mask at least twice a week, With my skin being deep cleanse and pores unclog, my skin is able to absorb more skincare products when I apply them on, and have them performing better so I can achieve skincare result in a much faster and efficient pace. 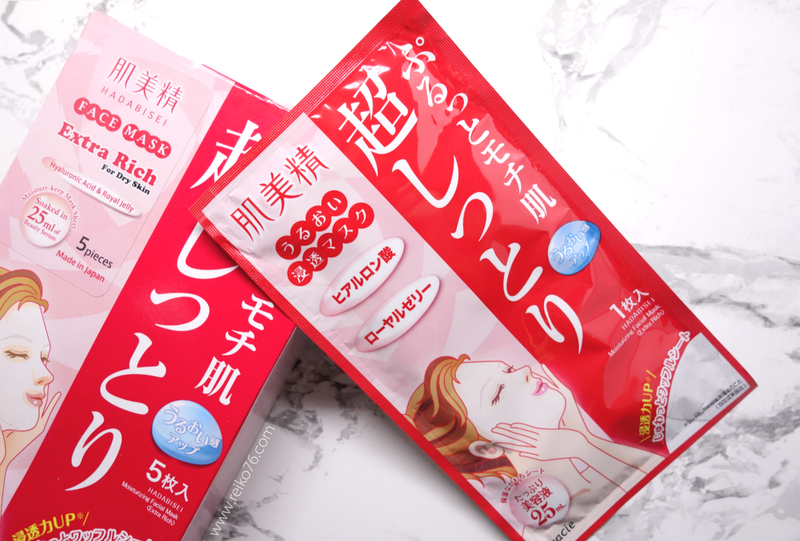 Did you notice the difference before and after I apply Hadabisei's Super Moist Facial Mask? My skin literally glow in radiance and I'm elated about it. These supple waffle sheet fits perfectly on my face and I can blog, edit photos and read books without having to worry they slid off my face. Remove mask and massage the remaining serum into my skin and voila, my skin literally glows with bouncy touch. Shopping centres nowadays are getting the most of them if compared to any other normal shops, so as the one explained in this blog. this centre seems to be one of the greatest!